A couple of weeks ago, a Jesuit companion and I were able to get rush tickets to see the Canadian Opera Company’s production of Francis Poulenc’s Dialogues of the Carmelites. Based on the true story of a group of Carmelite nuns who were martyred during the religious persecutions of the French Revolution, the opera consists of a series of “dialogues” between the sisters as they come to a unanimous decision to make a vow to accept martyrdom rather than renounce their vows and their common life. It ends with the nuns singing hymns as they are guillotined one by one, with the sound of the falling blade chillingly incorporated into the score. It is dramatic and gripping, which, given the subject matter, might at first seem strange, but if one thinks about it, every opera is basically a series of dialogues at heart. The work is greatly enriched by Georges Bernanos’s libretto, which contains many spiritually profound insights. Thematically speaking, Dialogues des Carmélites is an atypical opera: there’s nothing less theatrical, in fact, than the existential question at the heart of Bernanos and Poulenc’s text. While the typical operatic model deals with love and death, eros and thanatos, these themes are examined here in a much more abstract manner than is usual in an opera. Prescinding from the question of why an existential question cannot be theatrical (what about Hamlet or Waiting for Godot? ), I was struck by the assertion that this opera treats of love and death in an “abstract manner”. Carsen must be implying that a woman’s love for the invisible God is more “abstract” than the love between a man and a woman (a much more common operatic theme) and that the sober death of a martyr is more “abstract” than the passionate death of a Don Giovanni or a Tosca. This view indicates something telling about the way our culture understands what is real. Now, the word “abstract” could be understood in two ways in this context. First, it could be taken in its rather technical usage, to mean that a particular fact or feature is abstracted—i.e., drawn out of—a mass of data. 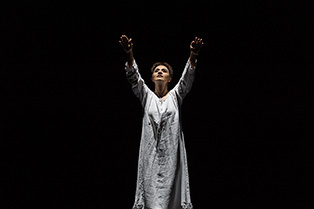 In this sense, Dialogues des Carmélites, does present an abstraction of love and death, for the music and libretto crystallise these two forces out of the historical events with particular clarity. From the matter of the lives and times of the Carmelite sisters the opera draws our attention to the love of God and the kind of death that it can entail. However, Carsen probably had the more popular meaning of the word in mind: abstract as contrasted with concrete: abstract as notional rather than real. Even if he did not intend this signification, most people reading the notes would certainly understand it this way, because the default mindset of our culture is that the spiritual love of God is somehow less “real” than the physical love of those who are face to face. The resolute death of martyrdom is less “real” than the gore of battle. Behind this way of thinking is an assumption that reality is consists only in what can be seen and touched. The lover with a body is real, but the God of love, even if real, is not very real to us. Anyone with the least spiritual sense will sense that this conception of “reality” is far from satisfactory. An experience of God can be disarmingly concrete; the meaning of a martyr’s death can strike one between the eyes with alarming clarity. Even without ascending to mystical heights, it is clear that any kind of lover loves more than just a body that can be seen and touched. The most hackneyed list of attributes desired in a lover—such as one might find in the “personals” section of a newspaper—always include items like a “nice personality” or a “sense of humour”: realities which are patently immaterial. The fact is that although we human beings always start with what our five senses encounter in a world of three dimensions, we are never content to stop there. We seek a reality that is much richer than that. What we see is only part of what is real. The love and death of the Carmelite nuns in the French Revolution were not abstract, and neither is their dramatisation in Poulenc’s opera. I cannot speak for all the performances, but on the night that I attended, the audience was riveted to the story in a way that an abstraction can never accomplish. Whatever their various notions of reality might be, and whether or not they believed in God or the purpose of martyrdom, those watching the opera were aware that something really quite concrete was being represented. Adam, I also was able to see this production, and I found it very moving. It is not easy for me to imagine how it may have played to someone unsympathetic to, or uncomprehending of, the principal themes of martyrdom and divine grace, but I myself was deeply engaged from start to finish. I have sometimes said (what I think is true) that this opera should be counted among the great achievements in Catholic art in the twentieth century. As I left the opera house last week, I realized, to my amazement, that it is even better than I thought it was. I wish I could see it again. I'm glad you got to see it as well and that we had similar reactions! As to the point of how well different people engage with the opera, I think the truth is that religious sensibility still exists in people (as it always will), even if it is not always evident. The great thing about a work of art like this is that it can help the religious sense to surface. The real question is then, how can we help people explicitly use such a work as a point of departure for connecting with this latent spirituality?